A-List Celebrities? This must be a mistake. I have to confess, this film was a bit of a surprise. I was not familiar with the wonder that is High Spirits. Apparently, I was alone in this. 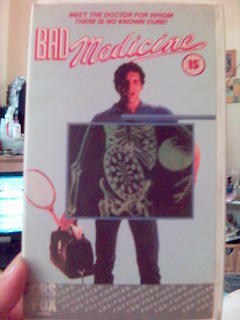 Of all the films I've collected so far, this is the first one that peole actually said "Oh, I think I've seen that one. Could I borrow it?" Borrow? A Steve Guttenberg film? This is unprecedented. And fabulous! That being said, I'm sure you're all familiar with the following film. It's the touching tale of a man who invents stories about ghosts in his castle to lure in tourists. Imagine his surprise when those ghosts turn out to be real! Oh, the hilarity! But wait - that's not enough for you? What could be more touching than the love between a man unhappy in his marriage and a ghost who's been reliving her own murder for the past two hundred years? Despite Daryl Hannah's "Irish" accent and a touch of Gutttenberg overacting, this actually isn't bad at all. It's pretty funny. And it's chock full of recognizable names! Who'd have thought? Peter O'Toole, Beverley D'Angelo, Jennifer Tilly, Peter Gallagher, Liam Neeson. In 1988, these were all big names, I'll have you know. I was very pleasantly surprised by this movie. And I'd probably watch it again. Who'd have thought? You'll never guess what today is. Well, yes. It is Wednesday. Wednesday the 24th of August. And what happened on August 24, 1958 in New York? A certain Mr. Steve Guttenberg arrived into the world ... and into our hearts. And so we say to you, Steve Guttenberg, happy 47th birthday. A Secret Affair. A Violent Crime. A Brutal Killer. I think we've made our first misstep on the magical road to Guttenberg happiness. And by "we", I of course mean me. 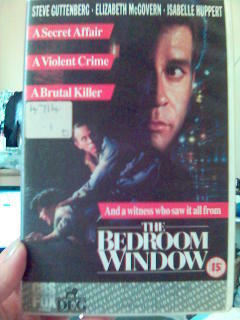 Through the wonder that is eBay, I managed to track down a little VHS I like to call "The Bedroom Window". You can see the drama right there on the case. A Secret Affair. A Violent Crime. A Brutal Killer. What the box fails to mention is the crucial last bit. A Boring Film. 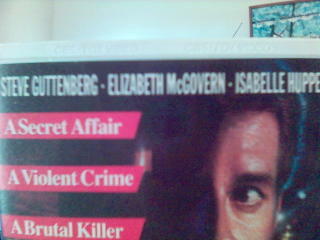 Now, it's exciting that once again Mr. Guttenberg takes centre stage with his top billing. Oh, he's certainly the star here. His intense, booding stare tells us that this is going to be one incredible rollercoaster of a film. The premise is a pretty good one: a woman is having an affair with her husband's employee. While at her boyfriend's house, she sees an attempted murder outside his bedroom window. To avoid giving away the affair, he reports the crime as if he'd seen it himself. Because his story isn't quite right, the police begin to suspect him as the murderer. How will he prove his innocence? See? It sounds good, doesn't it? Oh, but it all goes wrong. There are a lot of odd, intense, scary music cues that don't fit with the action on the screen. And all the actors speak with this tone of voice as if they're hiding something, making all the characters seem like they're lying, even if they're not. It's all very bizarre. Now, I'll confess that I didn't exactly watch the whole thing. I got a bit bored, and besides, I had laundry to do. So I missed how the Elizabeth McGovern character (who was the victim of the crime seen through the famed Bedroom Window) got involved with Steve-o. But they, of course, become romantically involved after the boss's wife gets sadly killed. Okay, it's not about the plot. It's about the miscasting of Steve Guttenberg in a dramatic role. The Gütt has a delightful, low key on screen presence. Do I want to see him taking care of an unexpected baby? You bet I do. Do I want to see him interacting with a robot who has come to life? I wouldn't miss it. Do I want to see him transforming himself from an overweight cartoonist into a leather clad Kiwi named Lobo? Just try and keep me away. Do I want to see him being intense and broody and running for his life? Um, no. 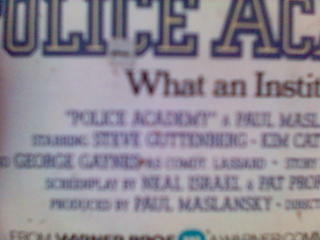 So, nice try Mr. Guttenberg. But it's just not working for me. Better luck next time. "Will she still love Lobo when she discovers he's really Gus?" It's an exciting two-for-one day here at The Steve Guttenberg Project! Perhaps you know it as The Boyfriend School, which seems to be how it's billed on TV. But I'm here to tell you that Don't Tell Her It's Me is a can't miss classic. 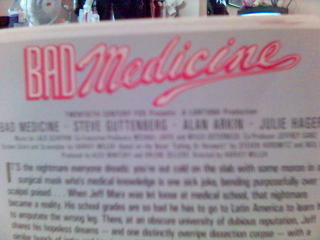 Steve is, of course, the first billed star. He's the one we're not supposed to tell her it is! He's the one going to the boyfriend school! 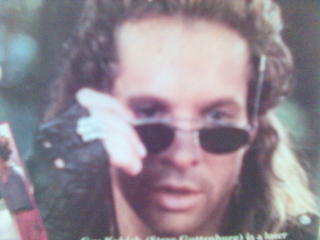 Right abouve his manly gaze, there it is. 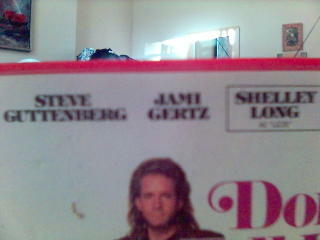 Sure, Shelley Long gets her name in a box, with the coveted "as 'Lizzie'", but I thnk we all know who the star is here. The premise is simple. Steve plays Gus, a cartoonist recovering from cancer. Shelley Long plays his older and bossier sister Lizzie. She's anxious to get him set up with a nice lady. She's also a romance novelist. Jami Gertz plays Emily Pear, a journalist who is out to get the true story of people behind romance novels. She meets Lizzie, and Lizzie realizes she'll be perfect for Gus. One blind double date later, and it's not love. So, Lizzie decides to turn Gus into the perfect man, who is apparently a mulleted, leather wearing, Kiwi named Lobo. You know how women love men named Lobo. And the hair. Ohhhhh, the hair. How could you not fall in love with this man? Now, it doesn't all go smoothly for Gus once he becomes Lobo. Aftter he woos Emily into bed and makes sweet, sweet love to her, he feels the need to confess. Surprisingly, Emily does not take kindly to being lied to and kicks him out of bed. What will happen? Will Gus get his lady? Will Lizzie interfere? Will there be a last minute airport kiss? Yes, yes and my goodness yes. Now, I have a confession to make. While this movie certainly wasn't good, it wasn't the worst thing I've ever seen. In fact, I laughed a few times. I like Shelley Long. And she's pretty good in this movie. The Gutt's New Zeland accent is horrible, but he's kind of charming. And Jami Gertz is inoffensive. I would watch this movie again. Especially if it was on TV on a weekend afternoon. Judge me if you must. Cadet Carey Mahoney, reporting for duty! eBay really is wonderful, isn't it? After the exciting first eBay find, I thought I'd take another look. And oh, I hit the jackpot baby. Oh, that's right. 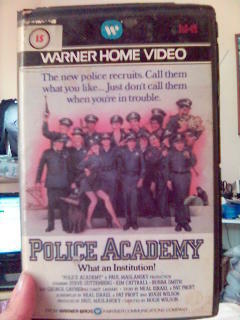 It's the classic first Police Academy. And is the box ever right - what an institution! Now, I was delighted to see that our good buddy Steve wins the coveted first billing in this cinematic gem. 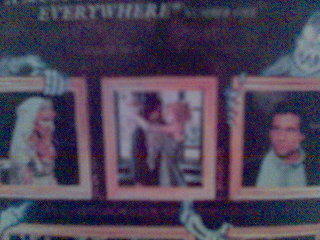 It may be a bit fuzzy, but it's there. And if you're taking first billing over the likes of Kim Catrall in the very year she appeared in the Oscar nominated** Porky's, then you are talking about a very impressive feat indeed. It turns out that "comedy" in 1984 was a bit different than it is today. Racial slurs, gay jokes and breasts don't seem to make up the majority of today's comedies. But that aside, it's not the worst thing I've ever seen. Steve plays Cadet Carey Mahoney, a loveably hot headed troublemaker who is sentenced to join the Police Academy after he wrecks a car at his valet job. And here's the clever part - he's not allowed to quit, but he can leave if he gets kicked out! Will wacky hijinks ensue? You bet they will! I didn't pay attention to quite a lot of the movie, so I missed why they get sent out to the riot, and I missed why Kim Catrall starts dating him, but all your favourite Police Academy characters are there: Hightower, Tackleberry, Callahan, Hooks, Commandant Lassard, Lt. Harris and that guy that makes the noises. Oh, Steve. Where will this exciting journey take us next? ** I really didn't bother to check my facts there, but it probably was. Come on! It's Canadian! Best foreign film all the way!